If you are talking about the world's biggest man then you have two contenders. The first is the world's biggest man alive today and the second is the world's biggest man of all time. 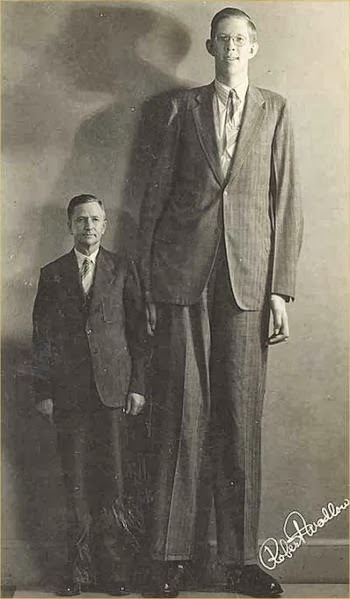 Robert Pershing Wadlow (February 22, 1918 – July 15, 1940) hits the ground running as the tallest person in history, with irrefutable evidence to back up this fact. Robert Wadlow is sometimes known as the Alton Giant or Giant of Illinois because he was born and grew up in Alton, Illinois. During the end of his life he reached an incredible 8 ft 11.1 in (2.72 m) in height, and weighed 439 lb (199 kg) at his death at age 22. His great size and continued growth in adulthood were due to hyperplasia of his pituitary gland, which results in an abnormally high level of human growth hormone. On July 4, 1940, during a professional appearance at the Manistee National Forest Festival, a faulty brace irritated his ankle, causing a blister and subsequent infection. Doctors treated him with a blood transfusion and emergency surgery, but his condition worsened, and on July 15, 1940, he died in his sleep at age 22. He showed no indication of an end to his growth even at the time of his death. Around 5,000 people attended Wadlow's funeral on July 19. He was buried in a 10-foot-long (3.0 m), half-ton coffin that required twelve pallbearers to carry and was interred in a vault of solid concrete. It was believed that Wadlow's family members were concerned for the sanctity of his body after his death, and wanted to ensure it would not be disturbed or stolen. He is still affectionately known as the 'Gentle Giant'. 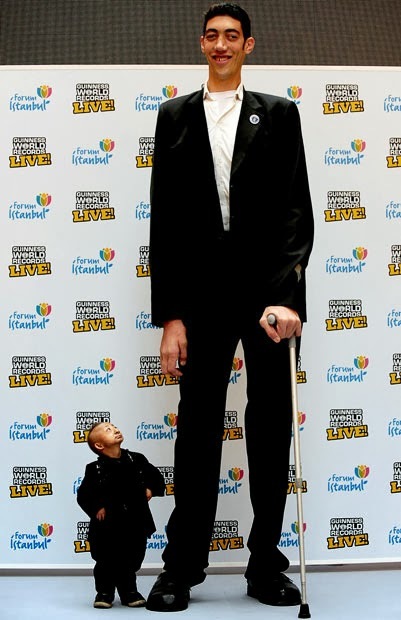 The tallest man living is Sultan Kösen who measured 251 cm (8 ft 3 in) in Ankara, Turkey, on 08 February 2011. Born in 1982, the part-time farmer was the first man over 8 ft to be measured by Guinness World Records in over 20 years. He became the world's tallest living man in 2009, when he measured 246.5 cm (8 ft 1 in) in height. Sultan also holds the record for largest hands of a living person, each one measuring 28.5 cm (11.22 in) from the wrist to the tip of the middle finger. He previously held the record for largest feet on a living person, with his left foot measuring 36.5 cm (1 ft 2 in) and right foot measuring 35.5 cm (1 ft 1.98 in). Sultan's growth and massive height caused by a condition known as 'pituitary gigantism', which is the result of an overproduction of growth hormone. Growth hormone is released from the pituitary gland in the brain; if the gland is damaged by, say, a tumour, it can release too much (or too little) hormone. The effects of overproduction includes large hands, a thickening of the bones, and painful joints. Sultan didn't start his incredible growth spurt until he was 10 years old. But he finally appears to have stopped growing. Revolutionary gamma-knife surgery on the tumour affecting his pituitary gland, provided by the University of Virginia, USA, in August 2010, has finally halted his production of growth hormone. He took the title from Xi Shun who measured 2.361 m (7 ft 8.95 in) in height when measured in 2005.